The floods that plagued Calgary might be a distant memory for some but they remind one Alberta writer about the stark boundary between government and love of neighbour. Doris Daley was born and raised in southern Alberta. She lives a 45 minute drive or so from the Bar U Ranch where famous cowboys such as John Ware and Henry Longabaugh (the Sundance Kid) toiled for a time after the first herd of 3,000 head of cattle, having been driven north from Texas, established the ranching industry on the eastern slopes of the Rockies. One of her great grandfathers was among the first Mounties who rode out on the expedition of 1874 to bring peace and order to an emerging Wild West. Described by some as the female Robert Service, she is a cowboy poet. And in a single stanza, she describes her land, her people, their history and their values. In June of 2013, just west of Daley’s home of Turner Valley, folks knew flood. 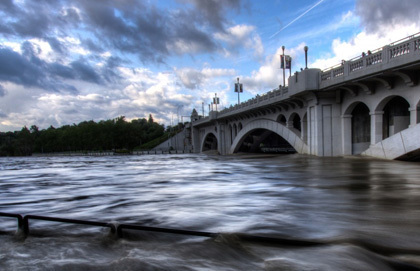 The core of Calgary was overwhelmed when, following heavy rains, both the Elbow and Bow rivers spilled over dams, converged upon and swamped the city. As many as 100,000 people were evacuated from their homes; and for a few days, the once-bustling civic core, bereft of people, took on a post-apocalyptic pallor. How that city rallied and, within two weeks, held its “Hell or High Water” Stampede is reasonably well-documented. As is the devastation that took place 60 kilometres south of Calgary in High River, where the swollen and rampaging Highwood River swept through the town of 13,000, formed a lake and then, when its banks burst, swept through the town all over again. At one point, water levels rose 20 feet in 20 minutes. The devastation there was so swift that more than 150 people had to be rescued from their rooftops as 350 Canadian Forces personnel and 80 RCMP were dispatched to the area. Word spread quickly that folks were in trouble. And when folks are in trouble, be it heartache, fire or flood, you don’t even think about it. You just go. And no one went faster than the people of the Hutterite colony near Cayley, just south of High River, where, within minutes of getting the phone call, Henry Walter called in the women to start making sandwiches, rounded up as many of the men as he could and made a beeline for High River. Gobsmacked by what they saw, their first acts were to save lives. Meanwhile, as most people watched helplessly as four people drifted by in a car, Robert Walter jumped into the flood waters after them and, although they couldn’t swim, got them all out and safely onto higher ground. The women, sandwiches wrapped, headed for the evacuation centre in High River only to find it overwhelmed by water and were directed to the recreation centre in Nanton, some 30 kilometres south. Emergency food resources to be supplied by first responders weren’t in place, so the Hutterite women took charge. “On that first day, we supplied everything,” Marie Walter (Henry’s wife) told the Nanton News. “Our fridges were empty.” The next day, food—meats, eggs, potatoes, vegetables, cheeses, pickles—began to arrive from 10 other Hutterite colonies across southern Alberta. Eventually, at least 20 colonies were involved as the Nanton recreation centre became home to more than 700 displaced High River residents. The cooking was non-stop, and the women worked 16-hour shifts. There will never be a list compiled of the supplies and food provided by the Hutterite people—members of the world’s oldest Anabaptist organization, who eschew private ownership, still speak ancient German, dress traditionally and live pious, hard-working lives. When municipalities later sought to tally up the costs, Marie Walter told the Nanton News, all she had was her memory to go on. “MacMillan Colony, they supplied a bunch of eggs, because we didn’t have any eggs. They did all the breakfasts and egg part. They made sandwiches and made two batches of bread—about 35 loaves each in a batch. Willow Creek Colony brought juice, pork and beans, toilet paper, soap, a variety of cold cuts, cheese, buns and bread. Wild Rose brought a dinner with 100 pounds of fried chicken and all the fixings, cinnamon buns, bread and a green salad. Starlight Colony brought juice and water, cans of ham and tuna, pork and beans, blankets and toilet paper. Lomond Colony brought ice tea, all forms of kitchen cutlery, plates, cups and napkins. Cluny Colony brought pie, cinnamon buns and other buns. Sunshine Colony brought bread. Leedale Colony brought hamburger, as did Arrowwood colony; and Lakeside Colony brought batches of cookies and coffee, ice tea and pop. Cameron Colony brought cold cuts. Livingstone Colony arrived with stew one evening with the works, potatoes, green salad and pumpkin cookies. White Lake made the beef-on-a-bun dinner. Samaritan’s Purse, a Calgary-based international Christian aid organization that had previous flood-aid experience following Hurricane Katrina, was on the scene swiftly and throughout the heartbreaking cleanup. Among them was volunteer and well-known country singer Paul Brandt. He had been at the MacDougall Church in Morley, on the Stoney Nakoda First Nation, working on a documentary related to his album of old Gospel tunes when the deluge turned to disaster. And while Morley was certainly affected by the flood, once people there learned of the devastation in High River, a group of volunteers from the Stoney Nakoda band joined Brandt in the recovery efforts. Samaritan’s Purse trained and deployed about 1,000 volunteers for five weeks in Calgary, High River and the Siksika Nation. Working alongside them were specially trained chaplains with the volunteer rapid-response team from the Billy Graham Evangelistic Association of Canada. The Church of Jesus Christ of Latter-day Saints volunteers—locally and connected to their international disaster-response teams—were also part of the equation, eventually establishing an ongoing volunteer unit called Mormon Helping Hands to provide ongoing assistance. There were, of course, a great many other, more secular, organizations such as Lions Clubs and individual acts of charity that similarly epitomized the generosity of people raised to love their neighbour. Country singer George Canyon, who lives near High River, and his band were on the way to the Calgary airport to launch a tour that was to begin in Philadelphia when news of the flood broke. They turned around and headed back to help. Among other efforts, they performed almost nightly at the Nanton relief centre, raising the spirits of the dispossessed. And, yes, government did eventually play its role. But while government and government officials are clearly vital to the organization and activation of emergency response and relief teams, they can never quite do what the Hutterites and others featured in this wonderful story did. Oh, they can help for sure. But they can’t love people. Love, compassion and empathy in the form it was expressed by the folks from Cayley Colony and elsewhere can be nurtured and protected by institutions, but it can never be institutionalized. It is a manifestation of deeply held beliefs expressed by heart and soul. Members of the Hutterite Brethren and other colonies, by the way, haven’t exactly been treated with open arms since first establishing themselves in Alberta. They have been mocked for their quaint ways and exclusions (Hutterites are allowed to have special schools and their children are normally assigned full work duties at age 15, so most have no more than a Grade 9 education. The first two Hutterite women to graduate from high school did so in 2001.) During the wars, they were despised for their passivism, and at times, for their communal prosperity. From time to time, efforts have been made to restrict their land ownership via legislation. Despite no evidence whatsoever that they have done any harm to individuals or society, government has worked with considerable passion to go back on its promise to immigrant Hutterites that their religious freedom would be respected. On the contrary, earnest legislators have applied themselves diligently to making them more like the rest of us. This most famously occurred when the Alberta government went all the way to the Supreme Court to remove allowance for those—most specifically members of the Wilson Colony east of Lethbridge—whose interpretation of faith did not permit them to pose for driver’s licence photos. Although the government won, no one has ever followed up to find out if a solution was reached. Little has been heard of the issue in the media or legal community since the publishing of a stunningly ungracious editorial in the Edmonton Journal on March 3, 2010. The paper’s editorialists, who have rarely found an individual rights or diversity issue they were unwilling to embrace and campaign for, had no tolerance for the Wilson Colony’s interpretation of faith and indicated that they had three choices: abandon their faith objection and comply with the law, surrender their driving privileges or—and perhaps this is what they really wanted—leave Alberta and go someplace where people tolerate their faith (Saskatchewan, Manitoba and Ontario have all made exceptions). Perhaps some folks did move. But the people of High River are certainly grateful that most did not. Throughout the almost 500 years of their history, Hutterites have known their share of persecution. They have known flood and fire and heartache. They have known fat and they’ve known bone. Yet by all accounts, they remain silver lining people who never ride alone.